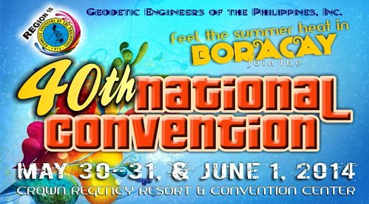 40th National Convention of Geodetic Engineers of the Philippines held at Crown Regency Resort and Convention Center, Boracay Island on May 30, 31, to June 1, 2014. We believed it was the first time that such promotion has been done for over the years. We have offered 50% off on selected items, 30% off on selected items, FREE additional battery and free prism set with prism pole for a single purchase of Total Station set for HORIZON, LEICA, AND SOKKIA brands. The event and the promotion were very successful. A couple of total stations set have been sold and orders and reservations have been placed for HORIZON, LEICA, and SOKKIA. Accessories such as Prisms, mini prisms, portable radios, auto levels, cross line lasers and other accessories has been reserved and orders also. However, selling was not our priority for such event, what was very special is meeting new friends and partners across the Philippine region. TWO (2) THUMBS UP BRIANNA!! !